Marriage can be messy. If you’re fairly new to it, you may be discouraged thinking something is wrong with yours. If you’ve been married for awhile, you may discouraged thinking this is all there is, and maybe even tempted to think you married the wrong person. I have good news for you–Marriage is messy because this is how God intended it to be. Wait, what? You heard me right. 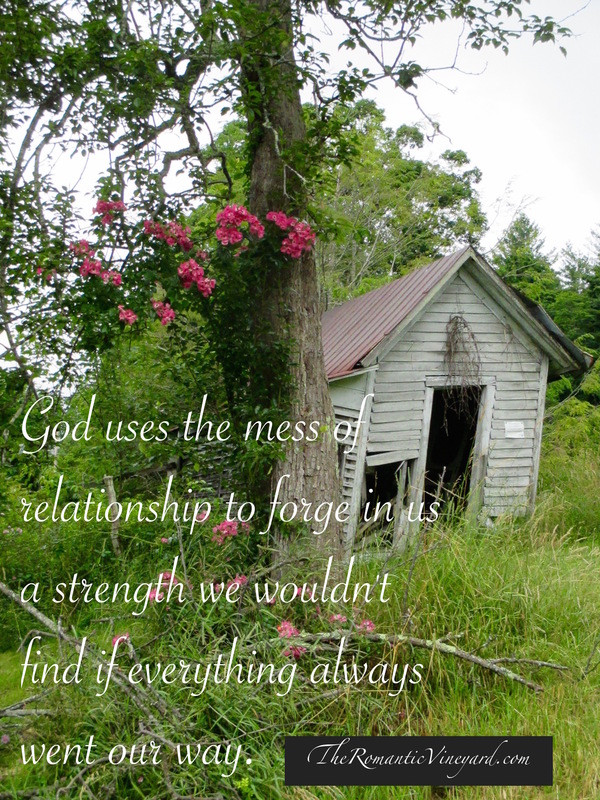 God uses the mess of relationship to forge in us a strength we wouldn’t find if everything always went our way. Paul Tripp and Tim Lane have written a book titled, Relationships, A Mess Worth Making, that offers powerful wisdom to those who are in the middle of the mess. We think things are going well only if we are getting along with others. But God says that it is also when we are not getting along with others that He is accomplishing His purposes! For example, if you quit at the first sign of fatigue when you exercise, you miss the chance to become more fit. Exercise after exhaustion is the most efficient and productive time for physical fitness. This is true of relationships as well. God has designed our relationships to function as both a diagnosis and a cure. When we are frustrated and ready to give up, God is at work, revealing the places where we have given in to a selfish agenda (the diagnosis). He then uses that new awareness to help us grow precisely where we have struggled (the cure). We enter relationships for personal pleasure, self-actualization, and fun. We want low personal cost and high self-defined returns. But God wants high personal cost and high God-defined returns. And although we frequently disagree with God, His plan is better. Beneath all our conflict with others lies a deeper conflict between these two agendas: ours and God’s. This isn’t an easy concept to accept because it requires an honest evaluation of what it is that motivates the way we love and treat our spouse. If you find yourself often disappointed or even angry with your spouse over seemingly small things, there may be something deeper in your heart you’ve been missing. It may have nothing to do with what your spouse does or doesn’t do as much as it has with what’s in your heart. Ephesians 4:17-32 is an excellent place to start as you seek God’s perspective on your relational mess. We shouldn’t be surprised by it, but rather thank God that we are seeing an area in need of being renewed by putting off the old man, and embracing the new. Take some time to read this portion of Scripture and pray for God’s help in honestly evaluating where you are in this process. What messes do you regularly find yourselves in as a couple? Join us tomorrow as we continue with more on this important topic. This entry was posted in Christian Marriage, communication, Conflict, Growing Strong Marriages and tagged Paul David Tripp, Relationships A Mess Worth Making, Tim Lane. Bookmark the permalink. Great post and your style reminds me of Beth at Messy Marriage. With any relationship, we work through the struggles to deepen the connection we desire. Glad to be your neighbor at Messy Marriage today. Thanks for stopping by. This is such an important aspect of growing a healthy marriage–it is “messy”, but most things worth doing are! I LOVE this, Debi! I hope that you share it and part 2 over at the Wedded Wed linkup! I don’t think I saw it there. This is packed with such important truths that we need to embrace in life and especially marriage!